DENAIR DAH-280/16 (280kw 16bar) high pressure screw air compressor was preparing for delivery work, the compressor will be shipped to Jeddah in Saudi Arabia, and it will be worked in King Abdullah University of Science & Technology in Saudi Arabia for Scientific research, the 280kw 16bar high pressure screw air compressor are the Top technology in the world, the quality have been highly appreciate by the customer who use other brand air compressor before. The compressor with the performance of 32m3/min @ 16bar with the low compression ratio, it equipped with a 280kw powerful electric motor, the neat and reasonable structure design make the compressor with good ventilation and heat dissipation. 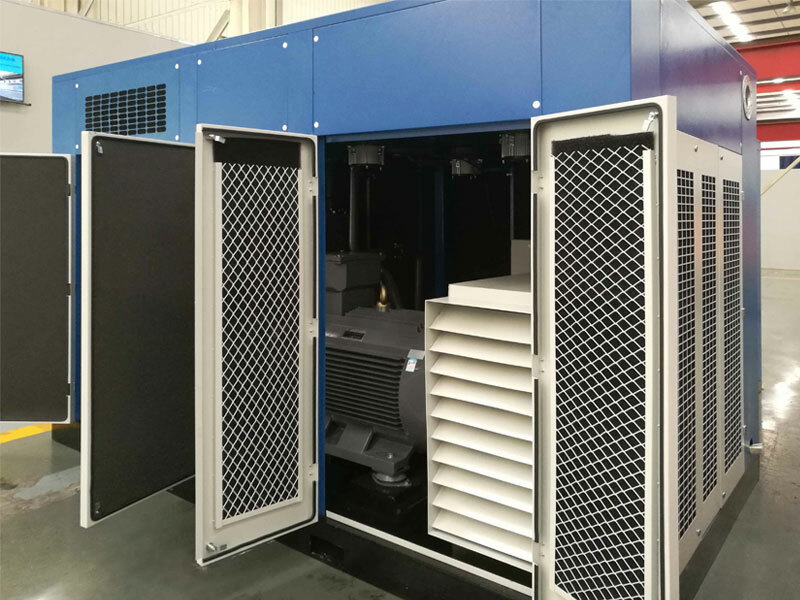 For the high temperature area, DENAIR 16bar high pressure screw air compressor special designed with the enlarged cooling fan, the bigger cooling area help the compressor get a better cooling affection, and the better cooling affection also extend the working life for the air compressor. The patent design of the oil gas tank reduce the pressure drop inside the oil gas tank and make the separating affection better. The low pressure drop and flow air loss also insured the high level energy efficiency of the air compressor. Stainless steel pipeline widely adopted in the compressor system, it keep the low pressure drop inside the air line system and the stainless steel pipeline will work longer time especially when the ambient temperature is high in summer, the stainless steel pipeline also have the advantage of lower noise and vibration than the hose.